This page is created to show some of my Video Clips. On this page there are 3 Performance (main, fire & glow) clips and 5 Juggling Tutorials, then 5 miscellaneous clips at the end. As of 1 March 2017, there are over 170 clips currently available on my YouTube Video Channel (where you can also review and rate the video clips). Please consider subscribing to receive my videos when they are released! You can access each YouTube Playlist directly by clicking on the links below (or to the right of the links are some sample pages on my website showing a taste of what my YouTube Channel contains in each category! Please enjoy, share and Subscribe – thankyou! 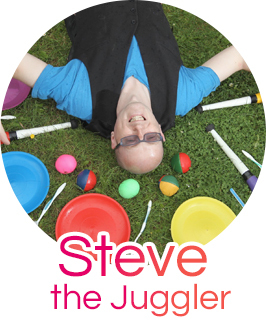 If you like what you saw, then please have a look around the Juggler for Hire section of this website. Perhaps starting with Steve the Performer page! If you like what you saw, then please visit my Fire Juggling Entertainment page for more details. If you like what you saw, then please visit my Glow Juggling Performance page for more details. View my Spinning Plate Tricks page for further help and tuition! View my Devilstick Tricks page for further help and tuition! View my 3 Ball Tricks page for further help and tuition! If you enjoyed these video clips, then please consider subscribing up to my YouTube video page and you will be notified as soon as I add more clips! You are also able to leave reviews and ratings.